A class ET22 electric cargo locomotive at the station of Ostroleka. The six axle ET22 is still today a very common cargo locomotive in Poland, especially with heavier trains. They were built by Pafawag 1969-1989. It weighs 120 tons, has a maximum speed of 125 km/h and operates only under the Polish 3000 V DC electric system. Over 1100 of these locomotives were produced and that explains why it is even today so common. Picture from Ostroleka 27.6.2015 by Ilkka Siissalo. 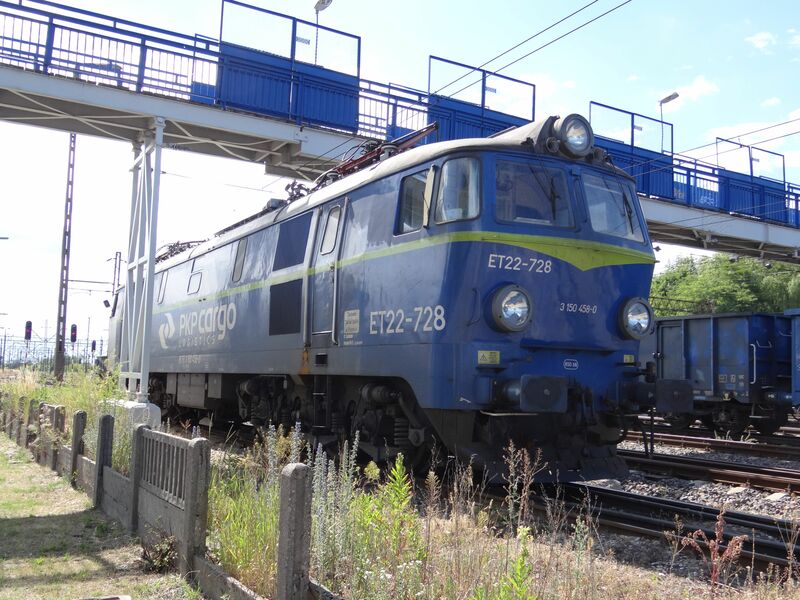 Two more ET22 locomotives used as a pair. Picture from Ostroleka station 27.6.2015 by Ilkka Siissalo. 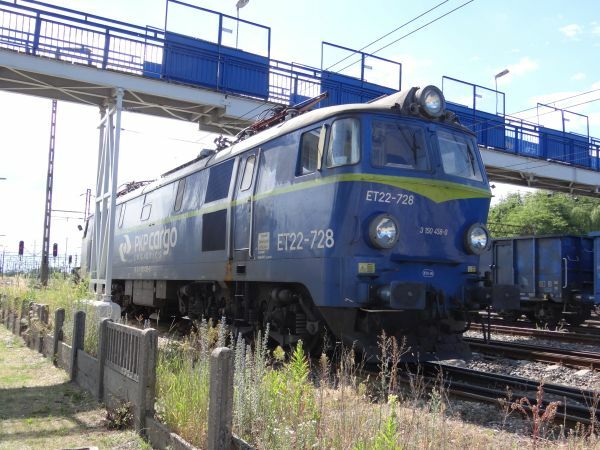 The same two ET22 locomotives as in the picture above. 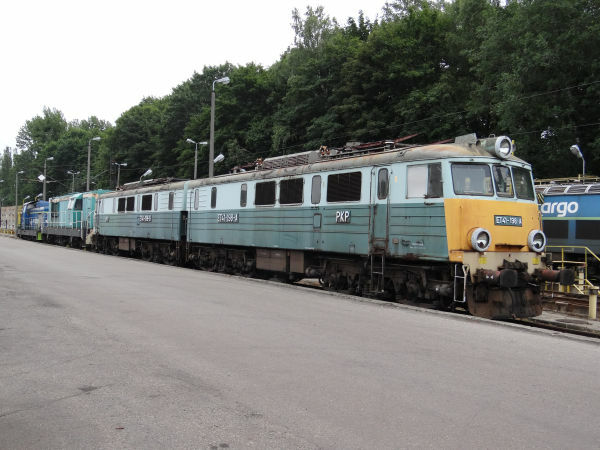 Note that the machine closest to the photographer has recently been partly renovated and the drivers' cab now has an airconditioning system installed on the roof. Also the headlight lamp over the winscreen window is different now. Picture from Ostroleka station 27.6.2015 by Ilkka Siissalo. This is how the ET22 locomotives used to look like during the communist time years. Picture from a scrapyard siding at Rybnik in Silesia 29.6.2015 by Ilkka Siissalo. Another ET22 in the green colours like they used to be. 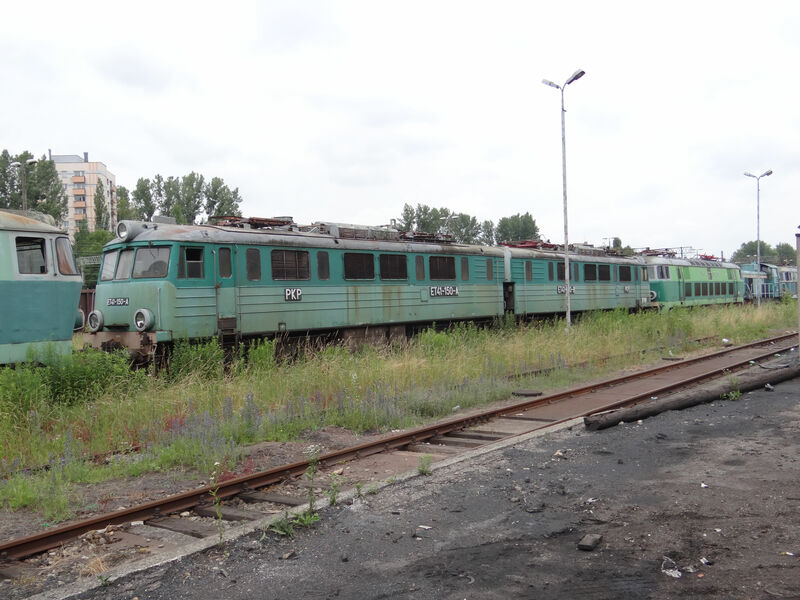 Picture from a scrapyard siding in Rybnik, Silesia 29.6.2015 by Ilkka Siissalo. 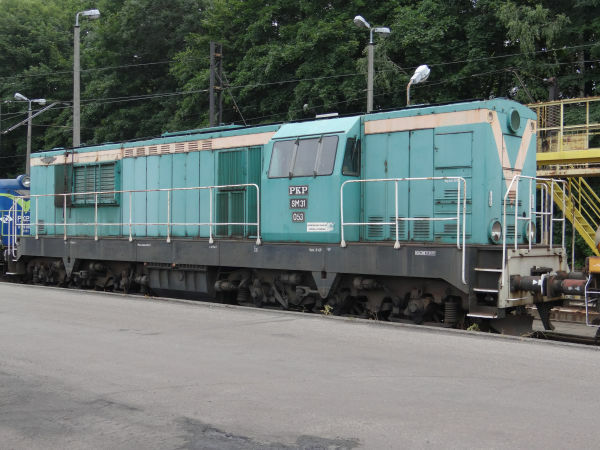 Poland is full of old SM42 switcher diesels, but this one does not even remotely resemble one, even though the text SM42 is clearly painted on its sides. It is a totally rebuilt SM42, modified by the company Newag and it is now a totally new machine. Picture in Suwalki 3.4.2017 by Ilkka Siissalo. 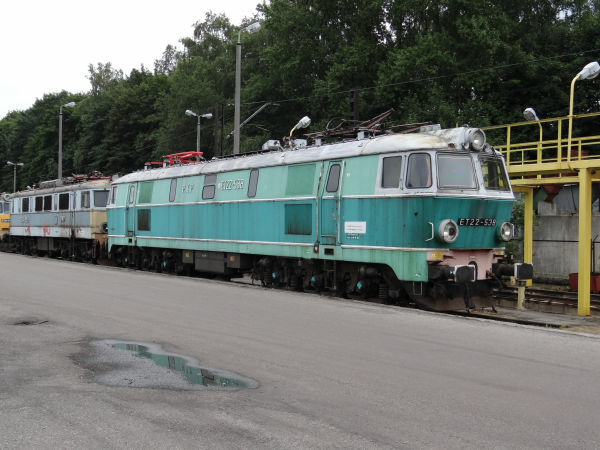 Poland used to be absolutely full of SM42 and SU42 locomotives, made by Fablok. 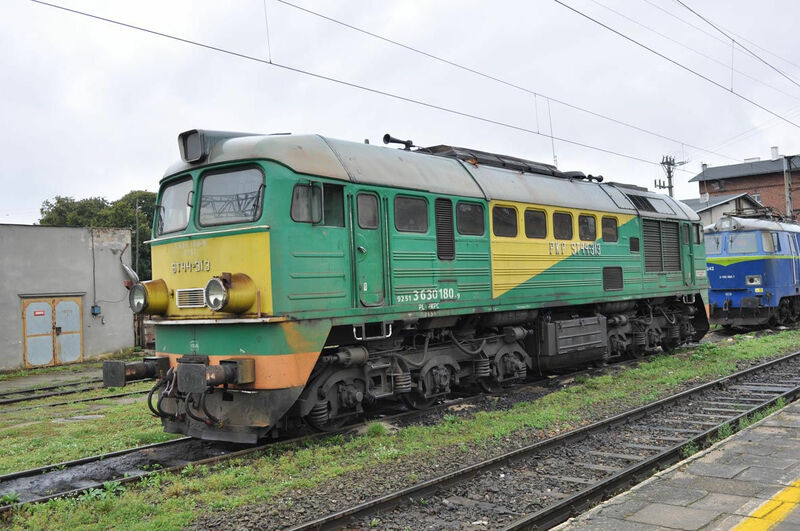 And in the old days they all were light green, just like most other Polish locomotives as well. These two types look the same. SM42 is the pure shunter versio, SU42 (U for universal) was also intended for main line use. There are still many of them in use and many are also being totally rebuilt, as can be seen from this page. This one and its comrades however, have found a resting place at the Chojnice scrapyard of outdated trains. Picture from Chojnice 5.4.2017 by Ilkka Siissalo. The type SU45 was a real universal machine (S stands for diesel, U for universal). 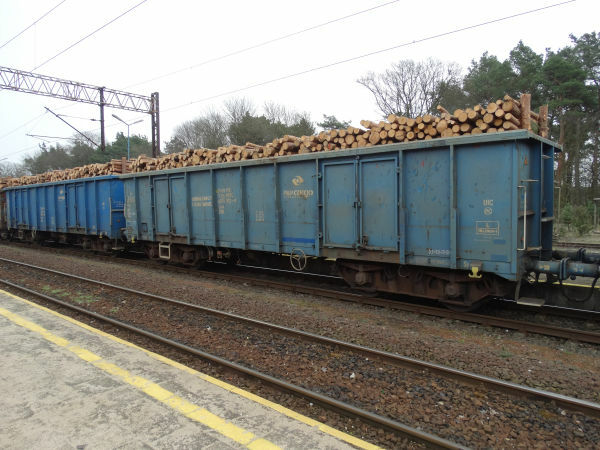 It was used both in long distance passenger trains as well as heavy cargo trains. A couple of them may still be in use, but most -like this one - have ended up at scrapyards. They were built by Cagielski 1970-76 and they had engines from Fiat. Picture from Chojnice 5.4.2017 by Ilkka Siissalo. In Nordic countries timber transport does not usually happen like this, with wagons designed for coal transport, but in Poland it does. Picture in Jastrowie 5.4.2017 by Ilkka Siissalo. 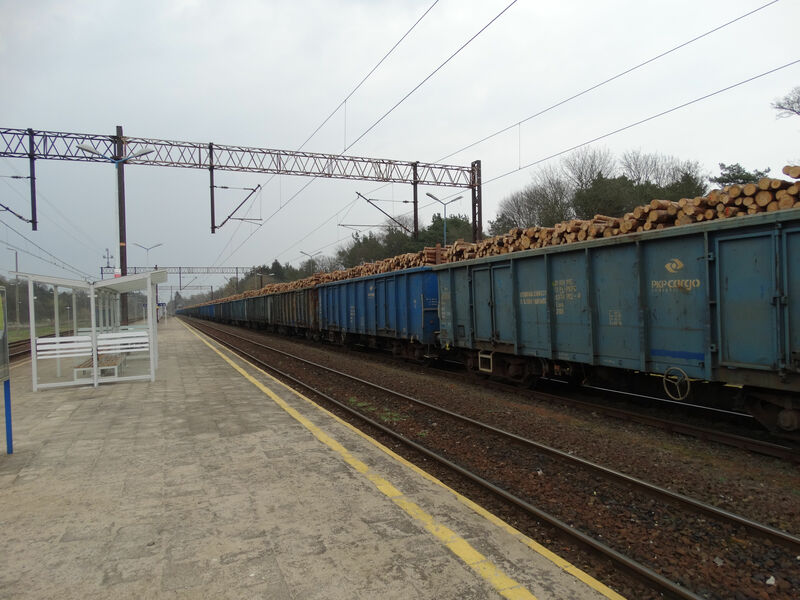 ...and it wasn't just one or two logs 8-) Picture in Jastrowie 5.4.2017 by Ilkka Siissalo. An originally Soviet locomotive of the Polish class ST-44 (elsewhere known as M62, according to its Hungarian class naming), here still seen in its old green livery. Very few ST-44s/M62s have survived till nowadays, except in Russia and some of the ex-USSR countries. This green painting still very much resembles its original Russian green livery, except that the large yellow patches have been added. These machines are already from the 1960s and most of them were built in Luhansk, eastern Ukraine. 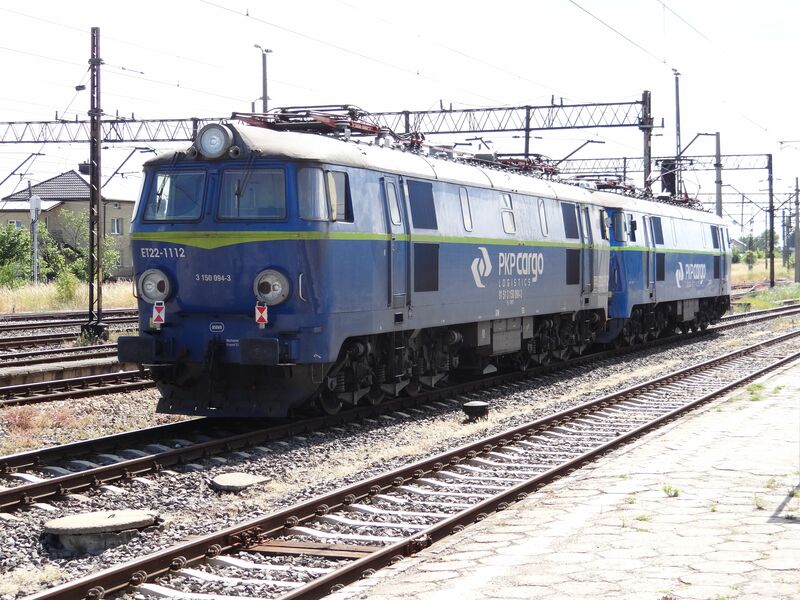 In contrast with the Russian M62s, this one has the yellow colouring and also buffers. Russian locomotives only use central couplers. Polish ST-44s also have bigger lamps as the rest of the M62 models. Picture from Korsze station 19.8.2017 by Marek Graff. 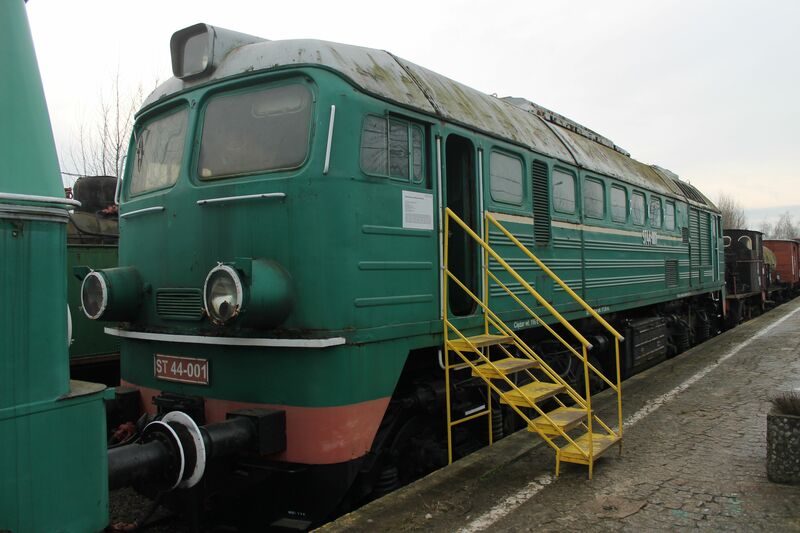 The very first class ST44 or M62 machine of Poland, ST44 001 in its original green livery. Picture from the railway museum in Warsaw 28.12.2017 by Timo Varshukov. 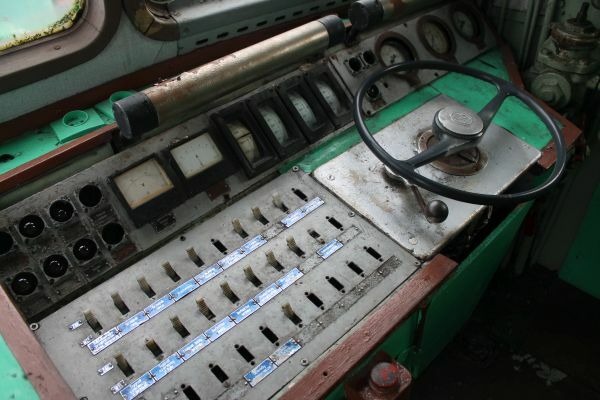 The driver's desk of ST44 no.001. 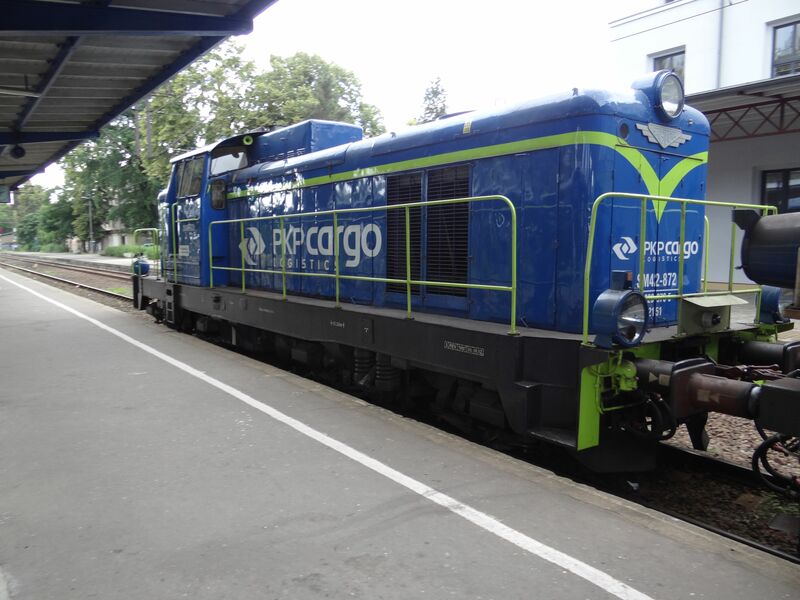 Most of the still surviving Soviet ST44 / M62 locomotives are today in these PKP Cargo's blue colours. Here we see an ST44 hauling a switcher machine which had broken. 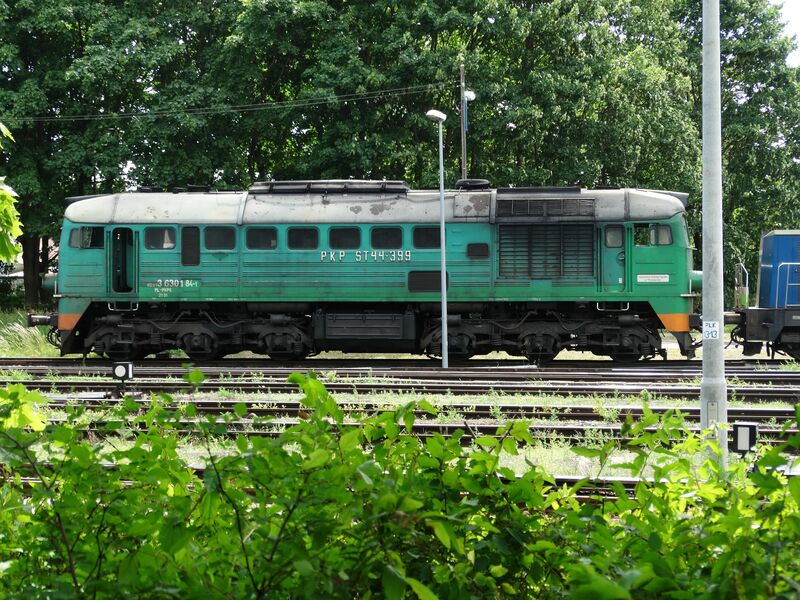 Picture from Elblag station 30.6.2013 by Ilkka Siissalo. Another view of the same ST44 machine as in the picture above. 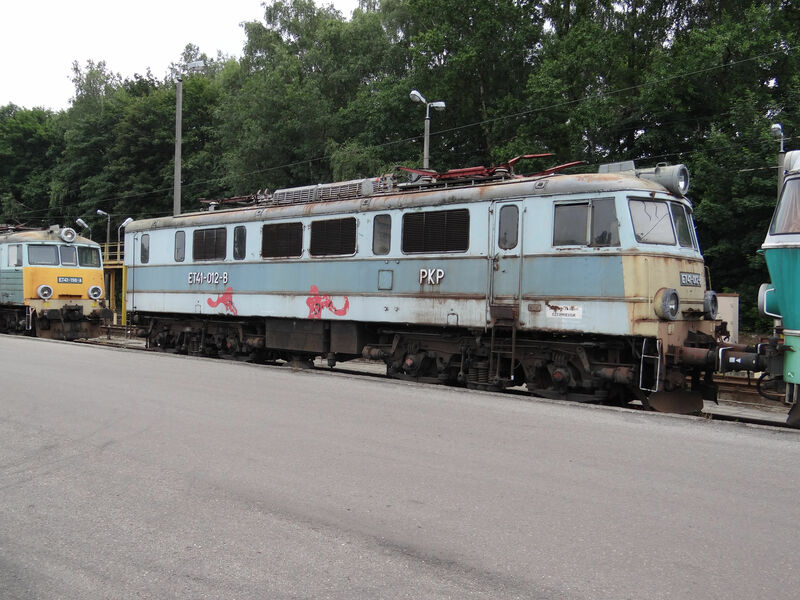 In modern times it is VERY rare to see a Polish ST44 / M62 in its very original colours, with not even a hint of yellow paint in it, but there was one in operational use near Suwalki station on 29.6.2018. And as it happened, the ST44 blowed out a huge cloud of black smoke and stopped. Two drivers inspected this and that and then figured out that the machine had run out of diesel fuel. 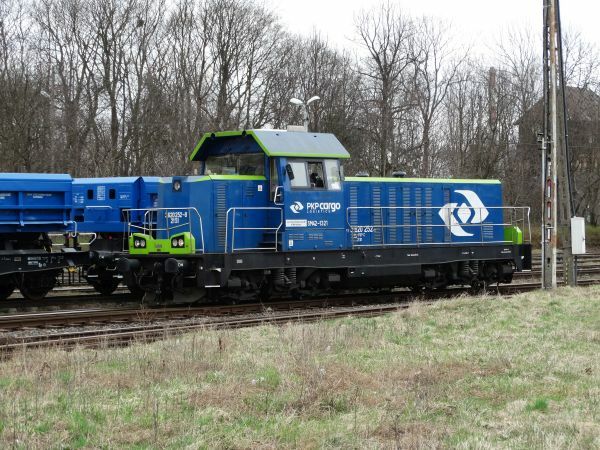 A modernised SM42 had to come from Suwalki station and drag the ST44 to a locomotive tanking place, where it refuelled for a LONG time, then blew out another huge black cloud, left the helping SM42 and continued with its duties. Picture from near the Suwalki station 29.6.2018 by Ilkka Siissalo. 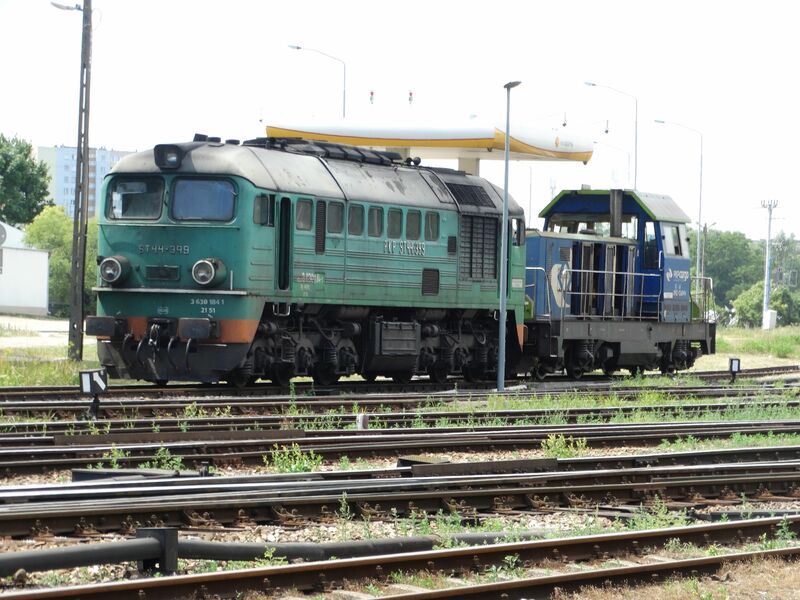 The same two locomotives as above. 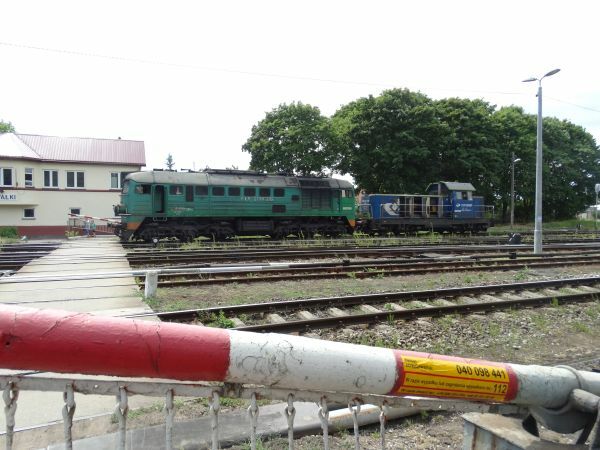 Here the rescuing SM42 has dragged the failed ST44 to the diesel filling station of PKP at Suwalki station. Soon refuelling of the very thirsty ST44 can begin. Picture from the Suwalki station 29.6.2018 by Ilkka Siissalo. Side view of the same old ST44 as above. 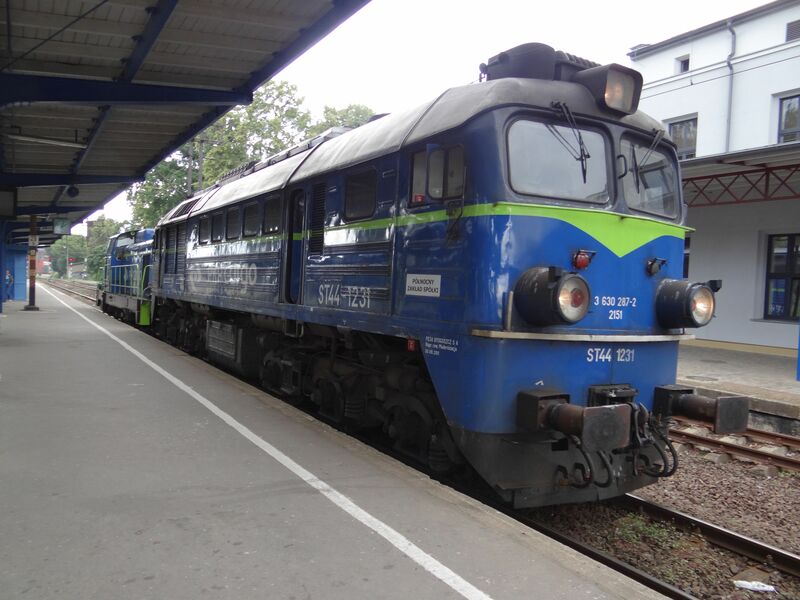 Here it is just being dragged towards the tanking place at Suwalki station. This was the SM42 switcher engine that the ST44 shown in the two pictures above was hauling. It's an old machine, but had been freshly painted. 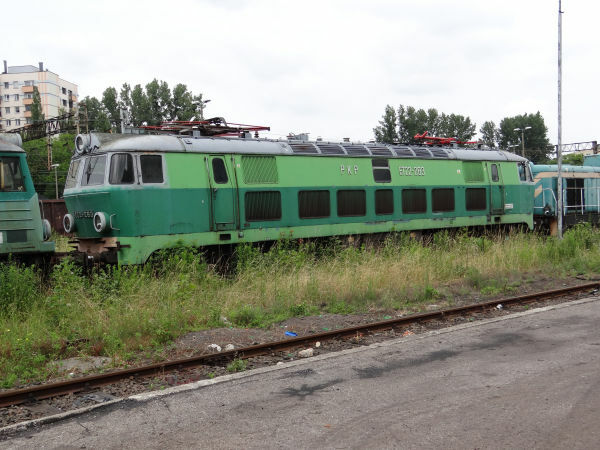 An ET41 double cargo locomotive at a scrapyard siding in Rybnik. The model was based on the EU07 and it is essentially just two EU07s coupled together. Almost all of these have by now been taken out of service. This one is still in its communist time colours. Picture from Rybnik, Silesia 29.6.2015 by Ilkka Siissalo. This was the two shades of green painting scheme that was the most common for ET41 double locomotives up to about 2010 or so. The machines were really commonplace, but now almost all have vanished. 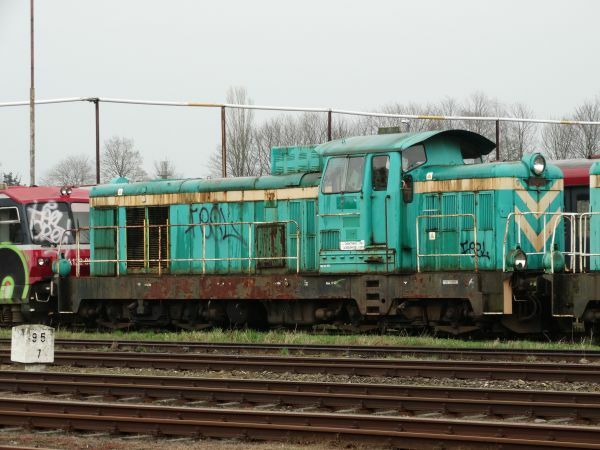 One half of an ET41 double locomotive on a scrapyard siding. The very first ET41s had smooth rather than sickled side walls. 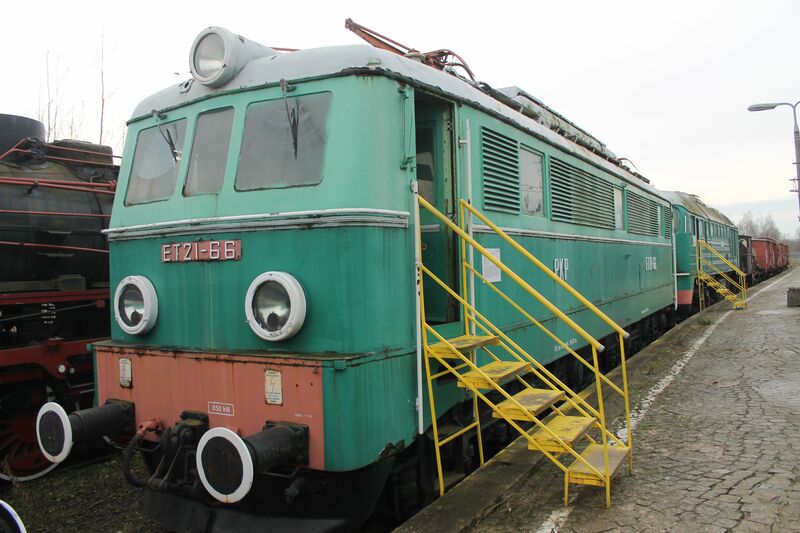 The class ET21 was a cargo train electric locomotive built by Pafawag 1957-1971 in 726 copies. It was a six axle machine weighing 114 tons and with a power output rating of 1860 kW. Electrical part of the locomotive was based on the Soviet Russian type VL22M (VL stands for Vladimir Lenin). Its top speed was 100 km/h. 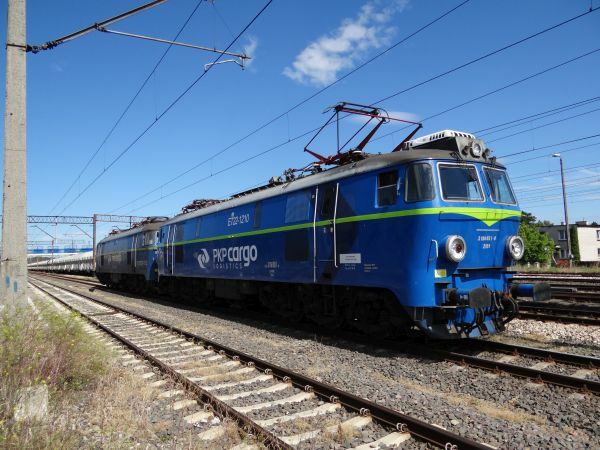 The last ones were kept in service in mountainous areas until lately as the machine is capable of handling cargo trains of up to 2500 tons of weight. 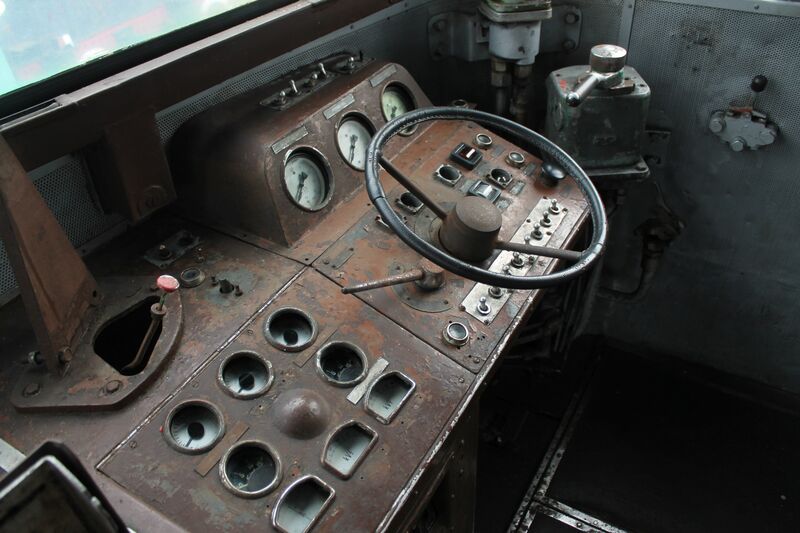 Driver's desk of the same ET21 locomotive as above. 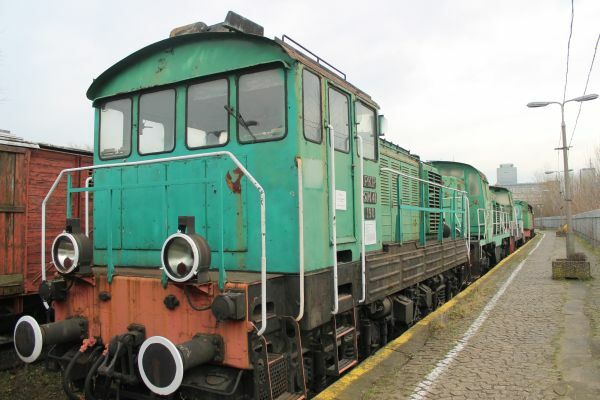 The SM31 was designed and built by Fablok in Poland 1976-85 for extremely heavy shunting, especially in harbours and in the Silesian coal mine areas. It was based on Fablok's SM42 medium heavy shunter and some previous US designs. About 200 machines were built. 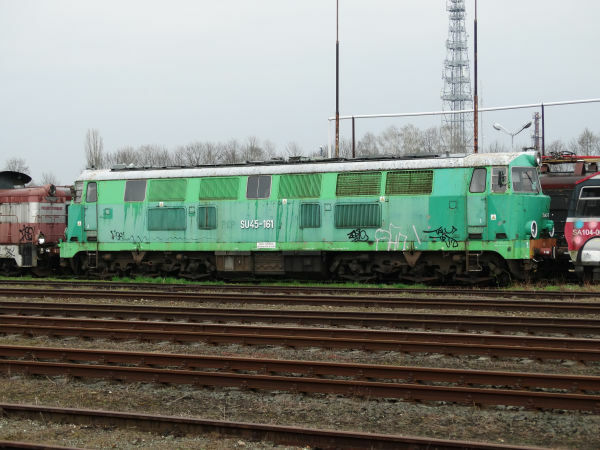 Most have been scrapped by now, but some are still in active use for example in Silesia. Its nickname was "Trumna", coffin. There's a V8 four-stroke diesel engine giving electricity for six 196kW traction engines on its six axles. The machine weighs 116 tonnes. 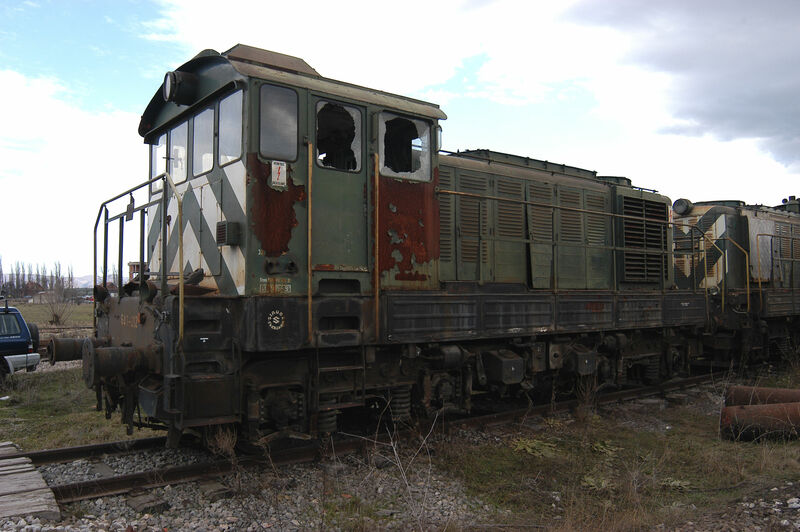 A class SM41 light diesel shunter. 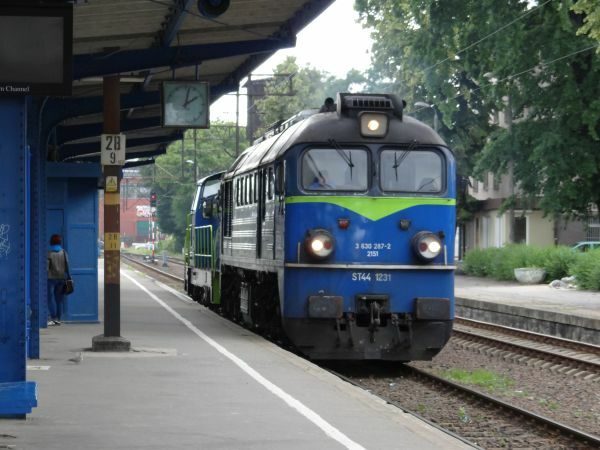 Polish railways began already in the 1950s its transition aways from steam locomotives and towards diesel and electric power, but in the beginning Poland did not yet have enough knowhow to build all the locomotives themselves. This type comes from the Ganz-Mavag factories in Hungary. In the 1960s it was the most important shunter locomotive in Poland and it was also often seen in front of light passenger trains. The same type was sold in numerous copies to Hungary, Yugoslavia, Bulgaria and the Soviet Union and they can be found still in many places. 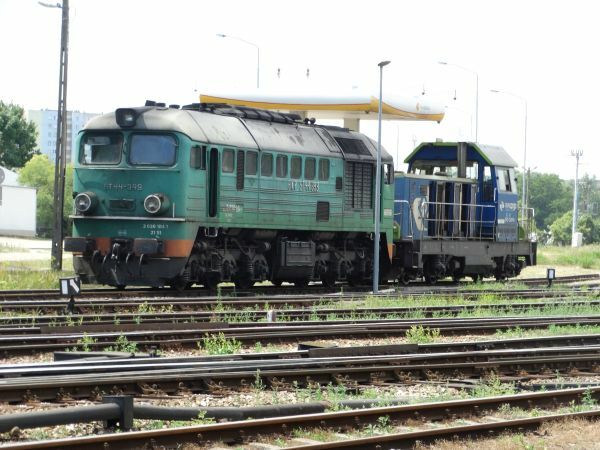 For a picture of a similar locomotive, see for example the section of Kosovo in this railway pictures archive. The picture can also be found here. Picture from the Warsaw railway museum 28.12.2017 by Timo Varshukov.